The voice of autumn is ringing loudly through the hills and hollers of home. The world is still filled with greens but there is the occasional yellow and rusty gold of the falling leaves. It is the undeniable beauty of September. I love the changing of the seasons and fall never fails to show up and put on a spectacular show of vibrant yellows, oranges, reds and browns. I am excited to welcome you in and show you around our kitchen and dining room this season. It is simple, nature inspired and filled with the lovely colors that this fall season celebrates. I have teamed up with some very talented bloggers this year as well as Kirklands who is sharing this tour with us. 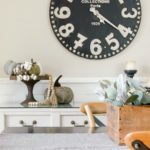 Kirklands is graciously giving away $1500.00 so you will want to be sure and enter that giveaway at the end of this post! So this may be your first stop on the tour or maybe your coming over from the beautiful tour of Lisa's home at Farmhouse on Boone. Either way I am so glad that your here! I recently shared how I added fall touches to the exterior of our home and one of my favorite products from Kirklands is these Olive Buckets. 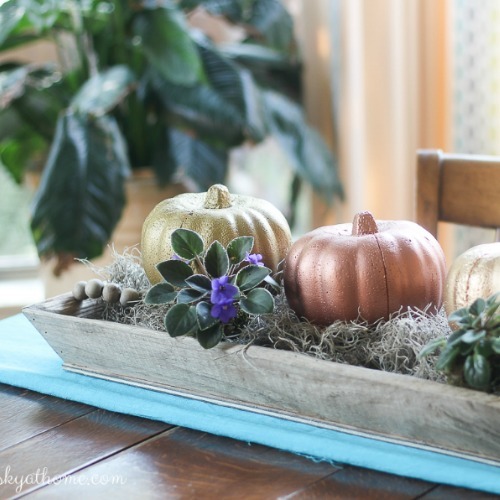 They were perfect for holding my mums this season and paired beautifully with white pumpkins. It was a small way to add a little fall welcome to our home. 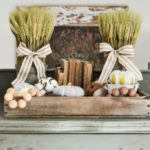 I really love the fall colors and chose to embrace them this year and allow nature to be my guide in how I decorated our home. We are a family that lives very simply and so it should come as no surprise that my style in decorating is the same. We use our dining room table as the school table, craft table and it is where we eat all of our meals. Any centerpiece that I decide to create has to be able to be moved. I love creating a beautiful space for our family and this year I went with one that they could actually use and that was still beautiful. I began by laying down a table runner that I found at a local store and then added a natural wood colored tray from Kirklands. I then added two vintage style metal candle holders with white tapers. The candles add a beautiful soft glow while we are eating and makes the meal feel a little more warm and cozy. I took a trip to my local grocery store and gathered up some pears. Then it was a trip to the local farmers market where I gathered the white pumpkins and squash. Then one day this past week the children and I went to a local neighbors home where we gathered some buckeyes. I then added and rearranged all of the elements until I was finally happy with how everything looked. In our home we all love sweet tea made in the southern sweet tea style! So, when I seen these glasses I knew they were just perfect for our table setting. These were purchased from my local Kirklands. Our table setting was simply our everyday dishes of a white plate, a bowl with a pear placed inside and white napkins. Our table setting may be simple but it works wonderfully for our family. The children love that they can eat the pears from it and I simply replace them with more as needed. The squash will be used for meals eventually and we have plenty of buckeyes to share or plant. I love that I don't have to box anything up at the end of the season to store for next year and that it was an easy and functioning centerpiece. Our kitchen island often seems to be the gathering spot in the kitchen area and not just for food and people. It can often be a catch all that I have to work hard to keep cleared off each day. I normally have a simple vase of flowers and a table runner to add a little pretty to this area. I cleared it all off for this fall season and added a little touch of nature. The tall willow basket was a find from Kirklands and I filled it with some bittersweet berries. Around the basket I placed the same items as what the dining room table has. 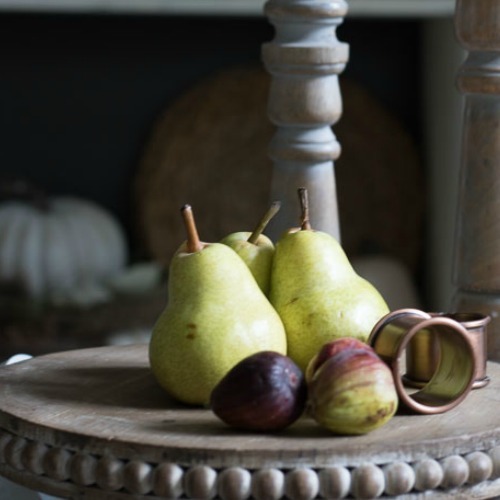 Pears, pumkins, buckeyes and a beautiful candle from The Freckled Hen Farmhouse. Our recent pantry makeover got a little fall touch with some pumpkin pie pumpkins and bittersweet. We will soon be making pumpkin pies with those pumpkins and I can't wait to share that with all of you! Our home may be very simple but it is filled with love of friends and family and that makes it even more cozy during all the seasons. 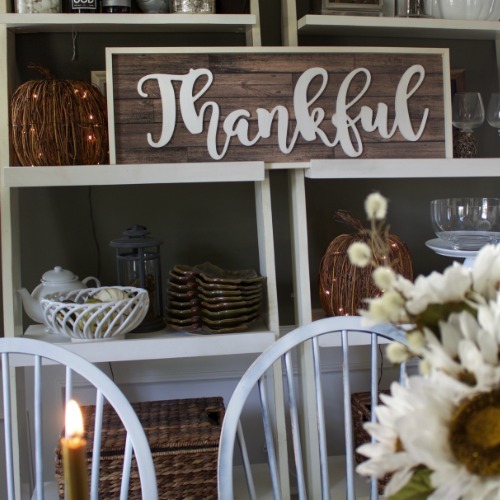 No matter where you may be in your home journey there is always a little something that you can do to make your home a little brighter for the Fall season. Our home is not perfect and we have many projects on the to do list but that doesn't discourage me from creating a beautiful space. I hope you have been inspired. There are so many talented bloggers on this tour and up next is the lovely Laura from Inspiration For Moms. Head on over to view her beautiful home and then don't forget to check out all the other amazing homes! Good Sunday morning! I have long wanted to make one of these gorgeous 100% linen aprons, and knew it couldn’t be that hard. So, this past week, I sat with a friend in her pretty sewing cottage and made one. It was so easy and I promise that you can make one as well! I will be sharing a tutorial plus printable directions at the end of this month on the blog. BUT, I will also be giving one away to my email subscribers. So, if you aren’t an email subscriber, you can remedy that by visiting rockyhedgefarm.com, click the about tab and then click subscribe!